Friday, 7 July, 2017, Dr Marcel Tongo Passo, a SANTHE Post-doctoral trainee, has won a "Best Abstract" award at the DELTAS (Developing Excellence in Leadership, Training and Science) Africa Annual Grantees Meeting 2017, held in Accra, Ghana, between 3 to 5 July. Passo is based at KRISP (KwaZulu-Natal Research and Innovation Sequencing Platform) and HPP (HIV Pathogenesis Programme) at the University of KwaZulu-Natal, South Africa. 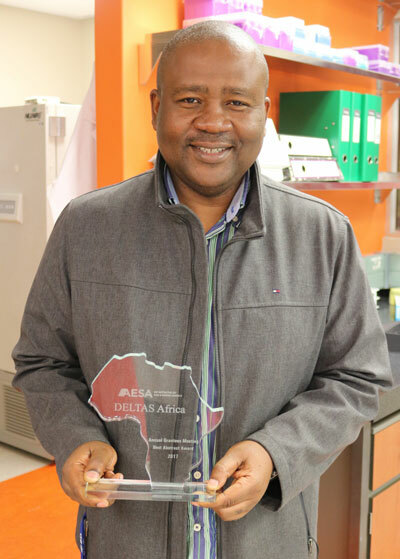 Out of 500 fellows from 11 cutting edge, public health related, research programmes - including 54 institutions in 21 African countries - Passo was selected to present at the meeting and ended up winning this prestigious award. He said he felt deeply honoured and grateful for the recognition. HIV-1M uses recombination as mechanism for generating genetic diversity. However, it remains unclear whether inter-subtype recombinants tend to randomly inherit particular genome regions from their parental genomes, or whether some genomic regions from particular subtypes tend to occur more frequently in recombinants than what would be expected under random recombination in the absence of selection. To differentiate between these two possibilities, we analysed the distribution within 79 circulating and 229 unique recombinant forms of genome fragments derived from subtype A, B, C, D, F, G and CRF01_AE viruses. We used a permutation-based test to identify genome regions that tended to be more frequently inherited from particular subtypes than could be accounted for by chance under random recombination. While genome fragments derived from each of the subtypes were scattered throughout the analysed recombinant genomes, statistically significant hot-spots of subtypes A and 01_AE derived sequences was detected in gp120, in RT for subtypes B and D, in vif for subtype C, in p24 for subtype F and in prot for subtype G. Conversely, statistically significant cold-spots were identified in vpu for subtype A derived sequences, in p24 and vif for subtype B, in RT for subtype C, in Nef for subtype D, in p17 and vpu for subtype F, in RT and p15 for subtype G and in RT for CRF01_AE. The apparent non-randomness in the frequencies which different subtypes have contributed particular genome regions to known HIV-1M recombinants suggests that selection may either favour or disfavour the survival of inter-subtype recombinants.